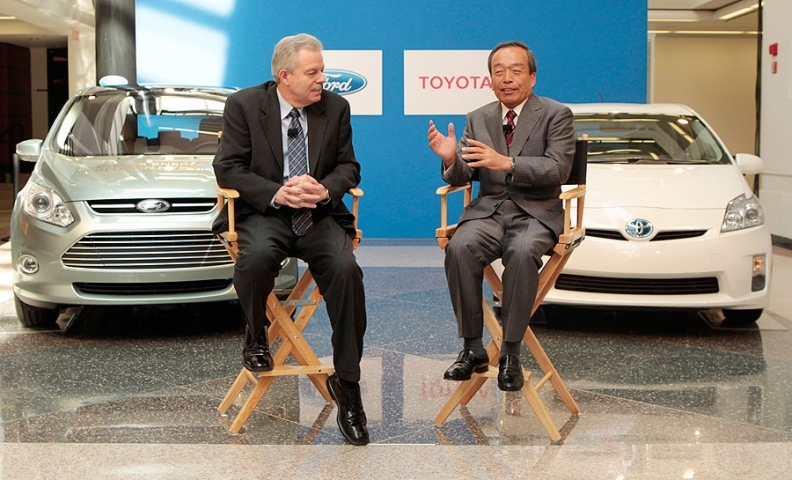 Derrick Kuzak, left, then head of global product development for Ford, and Takeshi Uchiyamada, who was then executive vice president of r&d for Toyota, unveiled plans in August 2011 to partner on hybrid light trucks. Kuzak has since retired and Uchiyamada is now Toyota's chairman. Ford and Toyota will continue to work jointly on standards for in-car technology and communication systems. Toyota, in a statement, said the automakers also "will consider other areas for future collaboration as well." The two automakers have signed an agreement in China to share emergency and customer-call centers, Nair said. Ford said today it boosted its electric-drive deliveries to 46,197 in this year’s first half, more than five times its year-earlier volume. Toyota led with 176,506 such sales, up 4.4 percent, as industrywide deliveries climbed at least 23 percent to more than 287,000, based on data compiled by Bloomberg. President Barack Obama won an agreement from automakers in 2011 to double the Corporate Average Fuel Economy for vehicles sold in the U.S. to 54.5 miles (88 kilometers) per gallon by 2025. That’s spurring more electrified vehicle production from automakers including Ford, which plans to triple output this year compared with 2011 levels, Nair said today. Ford and Toyota have declined to say which trucks and SUVs would have used the jointly developed hybrid technology. Toyota has dominated the global hybrid market since it introduced the Prius sedan in 1997. The Japanese automaker accounted for about two-thirds of the U.S. hybrid market in the first half of 2013. But Ford has made inroads in the U.S. hybrid market this year on the strength of demand for the Fusion and C-Max hybrids in California and other markets. Ford made up 15 percent of the U.S. hybrid market during the first six months of 2013, up from 3 percent during the same time last year.